Just as humans need food as our fuel, the sugarbeet plant makes sugar for fuel which is continually needed to stay alive. This process to produce sugar in the leaves is called photosynthesis. The sugars produced in the leaves are transported throughout the plant for energy. Sugar is moved through the phloem for growth and storage in the tap root (fig. 1). The phloem can be thought of as a pipe that allows water, nutrients and sugar to go from the top of the plant towards the bottom while the xylem is the pipe that takes nutrients and water from the roots up the plant. Anything that affects photosynthesis and transportation of nutrients and water in the plant can affect the stored sugar in the tap root. The first eight weeks after a sugarbeet plant emerges, there are eight cambium rings formed (fig. 1 shows four inner-most rings) with an additional four to five more rings forming later. The inner-most six rings make up 75% of the tap root. The cells in the root are larger the further away from the vascular tissue (where these phloem tubes exist) and the sugar concentration in these cells is less the further away from the vascular tissue. Research has shown that cells further from the phloem contain increased water and non-sugar dry matter such as potassium and sodium. The control for the partitioning of the sugar to the root has been found to be primarily in the root, although the genes and molecular pathways are not completely understood. Sugar content in the tap root has been found to be multigenic (controlled by more than one gene) but is still affected by environmental and cultural practices. Figure 1. 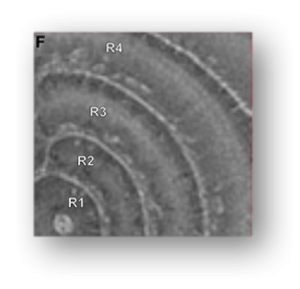 Cross section of sugarbeet showing rings. Vascular Tissue: the cambium is located in the center, the phloem is located very close to and on the outside of the cambium and the xylem is located very close to the inside of the cambium. Photo from: Metzner R., Dusschoten D., Buhler J., Schurr U. and Jahnke S. (2014). Belowground plant development measured with magnetic resonance imaging (MRI): exploiting the potential for non-invasive trait quantification using sugar beet as a proxy. Frontiers in Plant Sci., 16 September 2014. We know that varieties affect the sugar content of sugarbeets. Taking advantage of the Official Variety Trials and personal experience found on each farm will enable each Grower to choose the best variety for their farms. It is recommended to choose several of the top sugar producing varieties in regard to your disease and insect resistance needs, and try them on your farm. The Snake River Sugarbeet Research & Seed Alliance LLC has implemented a plan to bring higher sugar content varieties to the Snake River Sugar Company Members. Studies show a decrease in sugar content when planting or replanting starts the first part of May, middle of May, or later. It is theorized that later planting pushes the canopy development later and this causes the root and sugar development to be later also. The sugar content will continue to increase in the root until harvested or temperatures are cold enough to stop photosynthesis, which is believed to be between 24 and 26 degrees Fahrenheit. This late planting situation can also lend itself to higher beet nitrates, especially if nitrogen is applied as if the yield will be the same as if planted earlier. Table 1 shows Crop Year 2013 when the Cooperative had high replanted acres combined with a warm summer and fall. The sugar percentage was low and the nitrates were higher than normal. Applied nitrogen increases plant and root dry weight and leaf area. The root also takes up the nitrogen at the expense of stored sugar. Plants given more nitrogen do not send less sugar to the root, but the sugar is metabolized to grow the tap root. With additional nitrogen, the number of root rings remain the same but are larger; there is generally not an increase in the number of root cells, but there is an increase in the volume of each cell as you go further from the vascular tissue. As previously mentioned, these larger root cells have less sugar and increased weights of water and non-sugar dry matter. The key is to have less nitrogen available the last few weeks of growth in the late summer and fall to allow the sugar to be stored in the root and not go to top growth and excess cell growth in the root. Through July and August, soil nitrogen mineralization (microbial breakdown of nitrogen from organic matter) can provide much of the plant nitrogen needs. Figure 2 is a graph of the sugar content versus nitrates from 2010 to 2017. 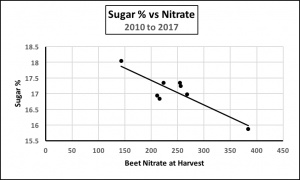 As we can see, the lower nitrates in the beet correspond with an increase of sugar in the beet, emphasizing the importance of nitrogen management. Anything that affects photosynthesis and its transport of sucrose throughout the plant will affect yield and sugar content. That is why it is critical to buy disease and insect resistant varieties that fit your needs and to be timely in the use of pesticides. Low night time temperatures in August and September affect the sugar content in the beet. These low temperatures, along with moisture received, killing frost, and replants account for much of the sugar differences between years and growing areas. The cultural practices, especially nitrogen available to the beet crop, explain much of the difference of sucrose content between Growers in the same area for the same year. 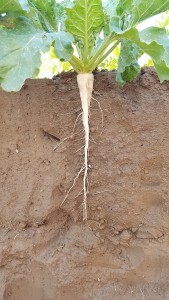 If Mother Nature helps us with a warm spring and summer coupled with cool nights in August and September, we have an excellent chance of high yields and excellent sugar percentage in the sugarbeet crop. Of course, the weather is beyond our control, but if a crop is managed properly with seed variety selection, planting date, proper fertility (especially nitrogen), and disease and insect control, the Grower will be in the driver seat and have the best chance possible for excellent sugarbeet quality and yield. This will provide better choices and bigger rewards to the Grower and his fellow Cooperative Members.